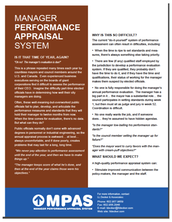 Managers Performance Appriasal System (MPAS) | LL DECKER & ASSOCIATES, INC. This is a phrase repeated each year by countless mayors and council members in many cities and towns. Part-time elected officials are faced with a difficult situation when determining their manager’s performance. 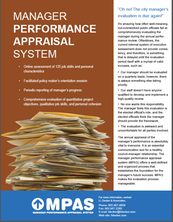 Oftentimes these well-meaning but overworked public officials fail to plan, develop, and articulate the performance measures and standards for which their manager will be held accountable in a year’s time. Public officials don’t usually have advanced degrees in business management or public administration, so this annual appraisal process is awkward and uncomfortable. If the process is performed poorly, it creates problems that may have long lasting repercussions. - Accurate, timely information that supports improved communication and decision-making. For more information download a copy of our MPAS Information brochure or our MPAS Process Design description.